Am I required to get a permit? Almost always. You do need a permit even if you are only replacing an existing fence. If your project is small, some repairs may not require a permit. Can I get my own permit? Yes, but it probably won’t be any faster than if we get it for you. We have a dedicated permit clerk on staff for immediate handling of any and all permits. Will I save money by getting the permits on my own, instead of having Ace do the work? We charge you exactly what you would pay to get your own permit, except for a minimal fee for submitting and retrieving the permits from the city in most cases. What else should I know about permitting? There are some prerequisites for submitting for a permit. A Notice of Commencement must be filed for any job with a value of $2500 or more. Some cities require a permission letter from the HOA with the application as well. If any part of your fence will be built in an easement, waivers must be obtained from all easement holders before a permit can be applied for. Can we build the fence before we get the permit? Ready to learn more? 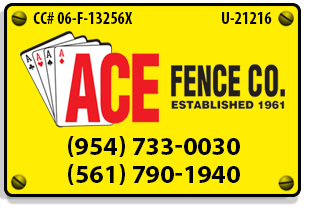 Click here to request a FREE Quote on Your New Fence!